Australia Day for us always involves having a picnic or BBQ and watching the fantastic fireworks display over the Swan River. We love how people come together to celebrate Australia Day, often wearing the Aussie flag on their clothing. It really is a day that celebrates national pride. 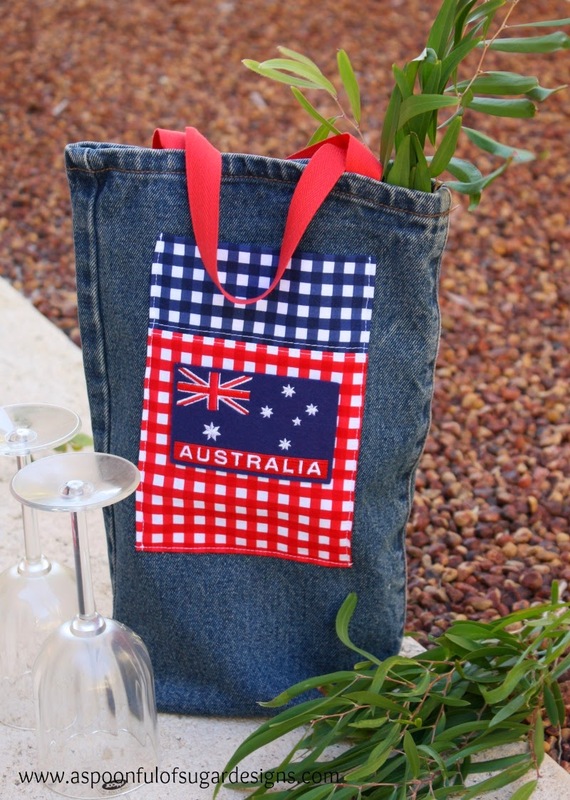 We have made a wine tote using a recycled leg from an old pair of denim jeans to take to our Australia Day picnic. 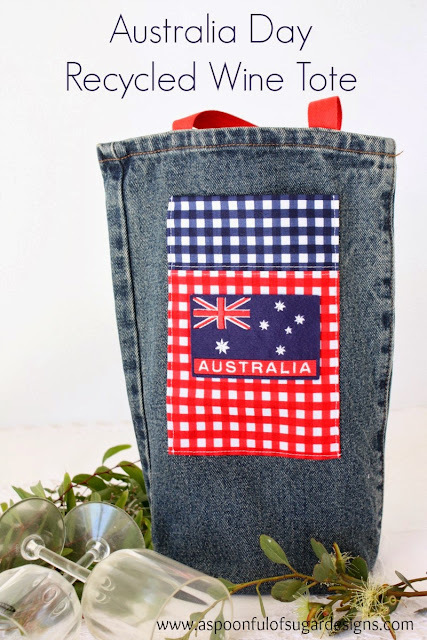 This is a quick upcycle project that involves adding a bright pocket, an Aussie flag, and some handles to a denim jean leg. 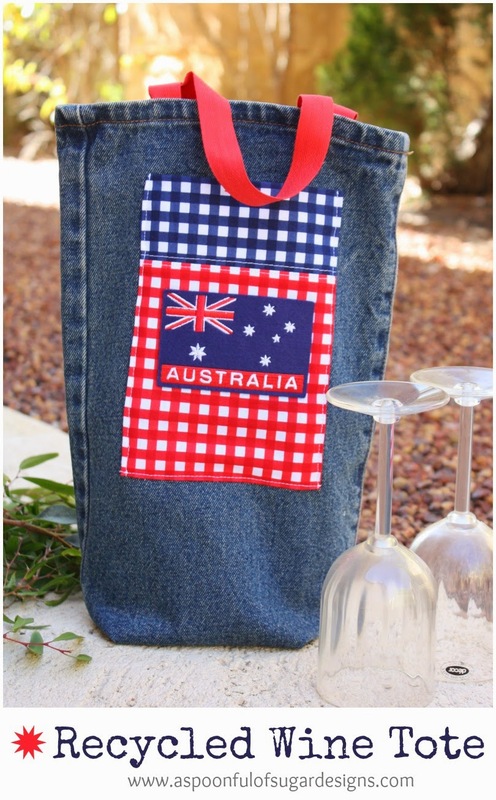 Cheap and practical – it is sure to add some good ol’ Australian spirit to your Australian Day event. 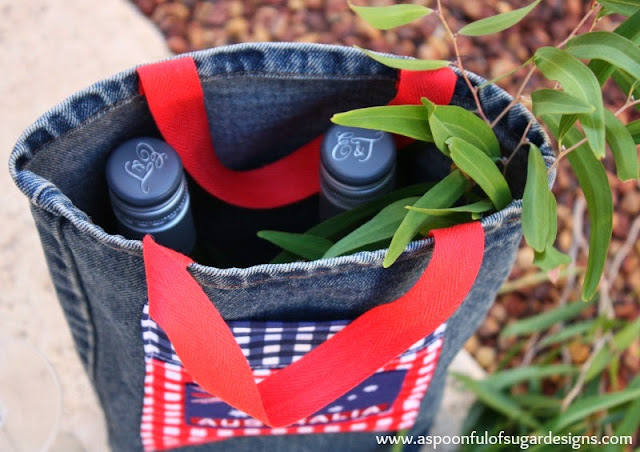 It is perfectly sized to hold two bottles of wine (or soft drink), with room to stow some eucalyptus leaves for swotting the flies that usually make an appearance. The handy pocket is perfect for holding a bottle opener or other supplies. One Jean leg (from adult pair of jeans), measuring approx 16 inches in length and 9 inches wide. 2. Create the base – Turn the denim leg inside out. Stitch the bottom of the tote together and overlock raw edges. To give the tote structure, box the bottom corners. Fold the tote so that the bottom seam is aligned with one of the side folds or seams, creating a triangular point. Draw a line perpendicular to the seam and 2 inches from the corner. This line will be around 4 inches long. (Photo 4) Machine stitch through both layers along the line. Repeat with the other corner. 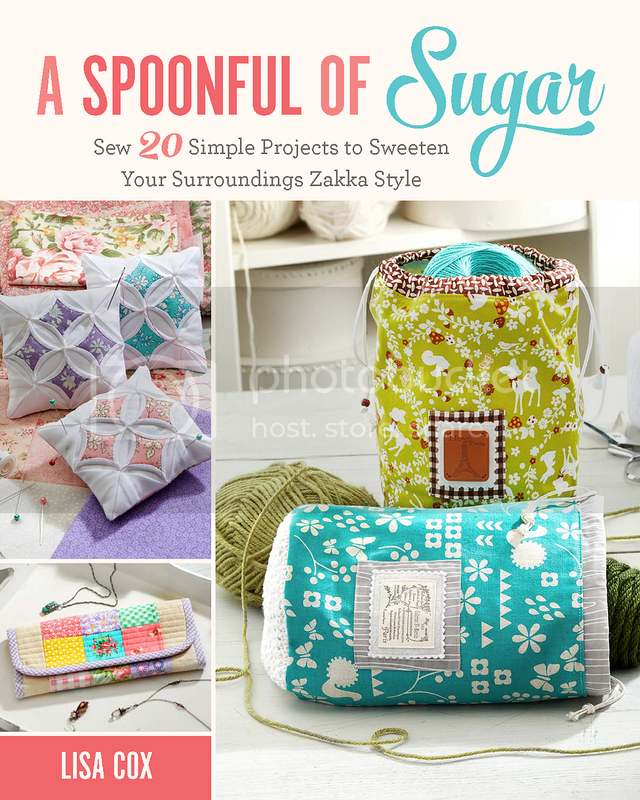 To strengthen the tote, leave the excess fabric in place and press the triangles toward the bottom of the tote. Turn the tote right side out and press. Measure the base of the tote and cut a piece of recycled plastic or template plastic the same size as the tote base and position it in the bottom of the tote. 3. Make the handles – cut two handles from the twill tape each measuring 12 inches. 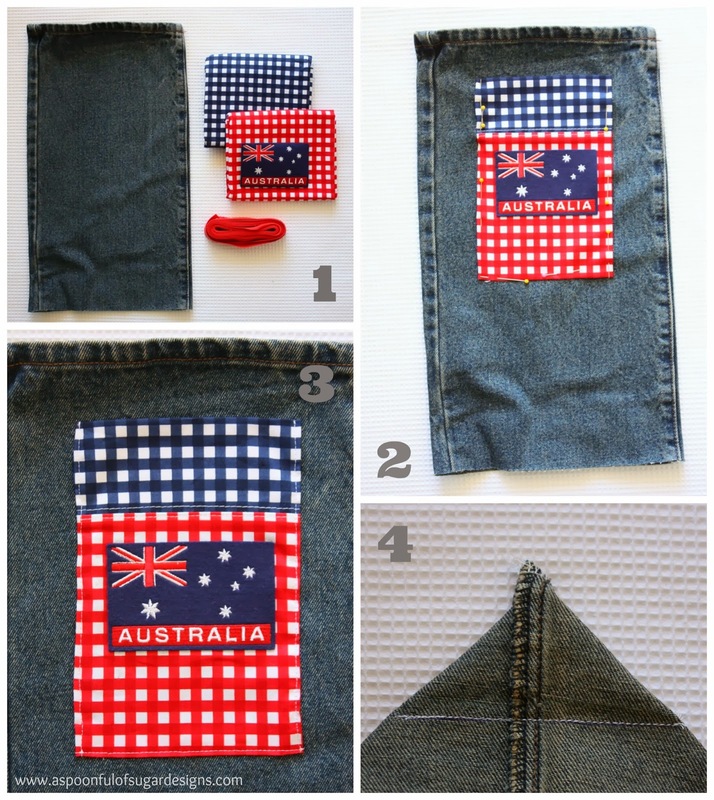 Fold under the raw edge and stitch to the inside of the top of the opening, approximately 3 inches apart. Fill your tote with picnic supplies and you are good to go! 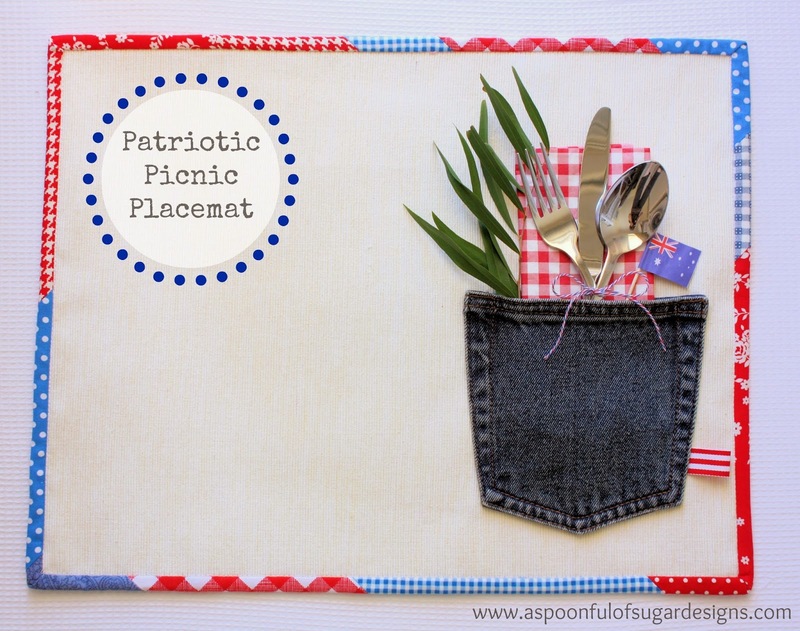 For more Australia Day sewing, check out our Australia Day Placemat Tutorial. 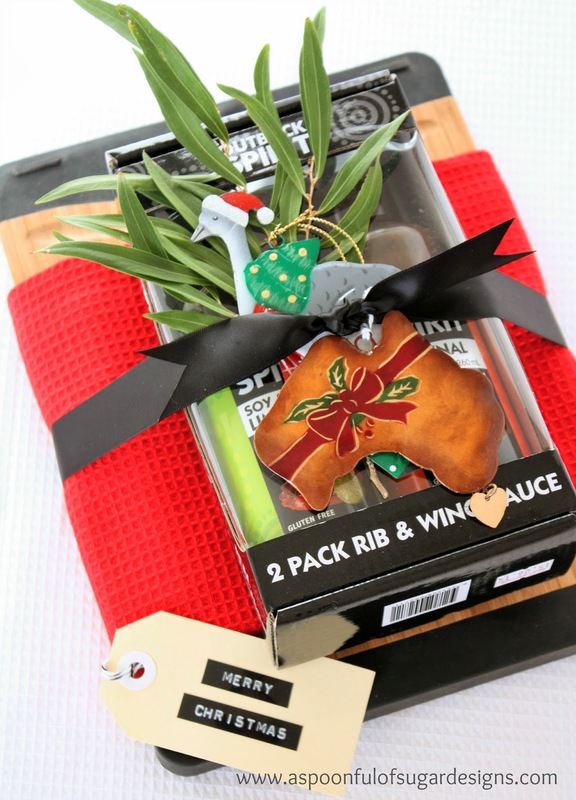 For a hostess gift with an Australian flavour, check out our hostess gift ideas.